Scythe's Twin Mounter 2.5 allows installation of up to two 2.5" SSD/HDD units in one 3.5" bay which is a great way to save space in a traditional PC case. With prices falling and storage pace increasing, 2½" hard disk drives former primarily designed for mobile PCs, but now they are becoming the hard drive of choice for quiet PC enthusiasts . Especially now that Solid State Drive (SSD) technology is becoming a must-have for users who want their PCs to be totally silent. 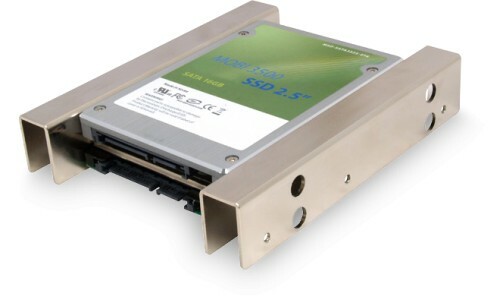 Twin Mounter 2.5 allows installation of up to two 2.5" hard disk drives or SSDs in one 3.5" bay which additionally means saving space in traditional PC cases. as somebody wrote - no sharp edges, no cuts! I put in-between those my SSD and 2.5inch HDD. really simple. the only bad bit - i fitted the disks in it the wrong way round and I ended up with sata connectors at the front of my case instead inside of it. There are no marks how to place it inside, so you may have to try doing it by yourself. on the other hand - it might had been a problem with my rig... There was a misalignment with the screws' wholes. Just fitted the disks other way round and fits in perfectly! not a cheap thin metal! properly built! not too heavy! perfect. Excellent product - works brilliantly. It's well made and replicates the screw hole position and type (i.e. wide thread) of a full size 3.5" HDD. This is not the case with some 2.5" to 3.5" adapters I've come across. One thing to note though is that if the HDD you're mounting is particularly deep (such as the newer 2.5" WD Raptor) you might have trouble fitting in a second disk into the same mounting. Doesn't detract from the product however, you'd just need to buy two! Just like the picture. Well made, neat and clean edges (no cut fingers yet). Comes with all the mounting screws needed. Fitted in my case's HDD caddy without issues. Very happy.